It is with some embarrassment now that I decided to postpone the launch of my first book An Introduction to Business Systems Analysis. We made the decision last Friday when the weather forecast was for severe weather conditions on Sunday and Monday. Schools were being closed until Thursday, UCD closed yesterday, Trinity postponed exams - it seemed as if the whole country was going to close down! I was particularly concerned that my Mum (Phil) and Dad (Joe) would not be able to travel from Carnew. So rather than sit here by myself, I decided the best thing to do was to postpone. Today nearly all the snow and ice is gone and there is no difficulty in this part of Ireland with travel. 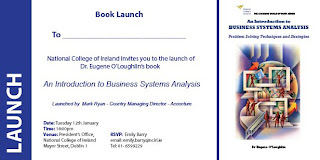 The launch is now re-scheduled for February 2nd at 6 o'clock in the President's Office in NCI.